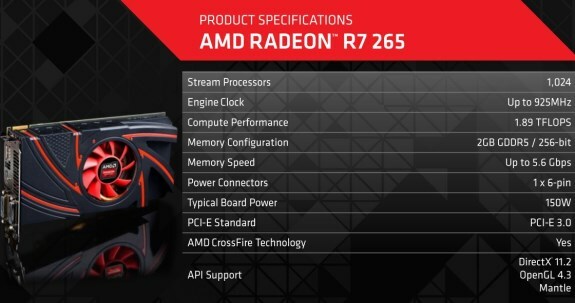 AMD has launched the Radeon R7 265, a new $149.99 graphics card based on the 28nm Curacao GPU that powered the nearly two-year old Radeon HD 7850. The specifications of this 150W TDP card are pretty much identical to the Radeon HD 7850, the main difference lies in the clockspeeds. The R7 265 has a 925MHz core and 5600MHz memory, whereas the 7850 has a 860MHz core and 4800MHz memory.